Dauers have a thicker cuticle layer than other larval stages (see Dauer Cuticle). This thick cuticle provides dauers with protection from desiccation but prohibits their ability to feed. Because of this physical separation between the alimentary tract and the environment, the intestine assumes a dormant appearance in dauers. When compared to other larval stages, the dauer intestinal cytoplasm is shrunken in volume and contents similar to what is seen in several other major tissues, possibly due to desiccation (DIntFIG 1 and DIntFIG 2) (Popham and Webster, 1979). This observation is consistent with the finding that specific gravity is increased in dauers compared to other larval stages (Cassada and Russell, 1975). The central lumen, around which intestinal cells are cylindrically arranged, appears contracted due to the absence of transiting food, and perhaps the passage of remaining lumenal fluid volume into the cytoplasm across the brush border. The brush border, which carries out the intestinal absorptive function, becomes shrunken with fewer and shorter microvilli (Popham and Webster, 1979). Interestingly, the very existence of microvilli in dauers may indicate that absorptive processes resume rapidly during dauer recovery (Popham and Webster, 1979). Parallel changes in microvillar dimensions and numbers are seen in aging C. elegans intestine, when it has been observed that animals reduce their food intake, grossly alter their intestinal cytoplasmic contents, and shorten their microvilli (McGee et al., 2011). 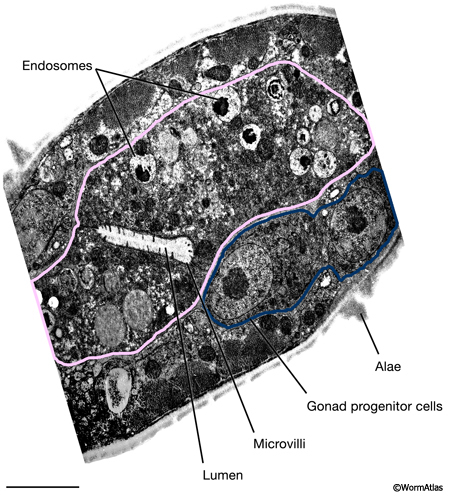 The cytoplasm itself seems more electron dense and compacted, with fewer remaining organelles apart from the nuclei. The intercellular adherens junctions, which seal the lumenal contents and prevent them from inadvertent mixing with the pseudocoelom, are more robust in the dauer, giving the animal a higher safety factor during its long wait for improved living conditions. The dauer cytoplasm contains large lipid or fat droplets that provide it with a source of energy during stasis (DIntFIG 2 and DIntFIG 3) (Albert and Riddle, 1988; Popham and Webster, 1979). 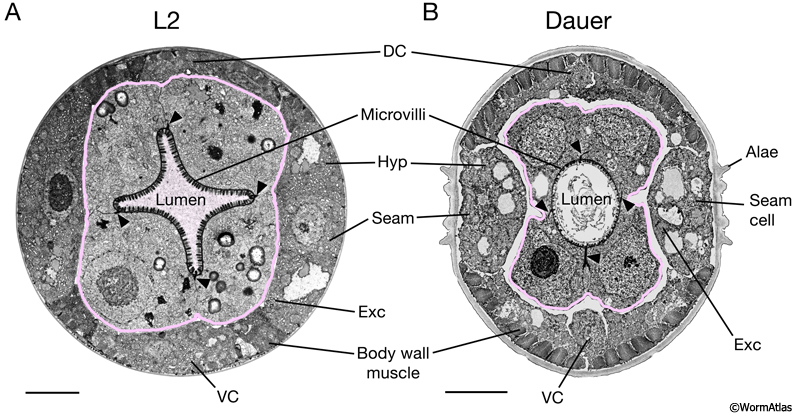 The dauer intestine also appears to contain electron-dense material resembling yolk (Hall et al., 1999), but much less than is seen in the L2 intestine. The intestine is the source of yolk production in most other larval and adult stages, and yolk can transit via the pseudocoelom to feed other tissues including new oocytes (Kimble and Sharrock, 1983; Hall et al., 1999). The vit genes, which encode the protein constituents of yolk droplets, are specifically expressed in adulthood and not in larval stages (Kimble and Sharrock, 1983; Depina et al., 2010). During dauer stasis, there are no developing oocytes (the dauer reproductive tract goes dormant prior to producing any mature oocytes), but maternally-derived yolk might still be supplied from the larval intestine to other tissues until it runs out. Yolk granules are present in intestinal cells of Haemonchus placei infective juveniles (Smith and Harness, 1971), and possibly in all dauer or infective stage nematodes. It is not known if the intestine could also supply lipid or fat reserves to other tissues in a parallel process to the supply of yolk. Autophagosomes are prominent in the intestine during virtually all stages of development, and are a key feature in maintaining homeostasis (Kang et al., 2007). They may play an important role in the general reduction in the volume and organelle contents of the intestine as it shrinks during entry into dauer, in parallel fashion to their role in changing the seam cell volume (Meléndez et al., 2003). During dauer arrest, metabolism slows (see below) and autophagy may also become less predominant. Thus, autophagic organelles may shrink and/or diminish in number until re-entry into L4 stage. The dauer’s nonfeeding status requires a metabolism that specialized in energy conservation over anabolism (Braeckman et al., 2009). As such, dauer larvae consume less oxygen and produce less heat and superoxide than larvae pursuing reproductive development (Vanfleteren and De Vreese, 1996; Houthoofd et al., 2002). In addition, beta-oxidation is activated in dauers to mobilize fat stores into energy (O’Riordan and Burnell, 1990). Dauers utilize the glyoxylate cycle to convert acetyl-CoA products of beta-oxidation into fatty acids (Braeckman et al., 2009; Liu et al., 1997). These metabolic changes seen in dauers occur through both transcriptional and postranscriptional mechanisms (Holt and Riddle, 2003). C. elegans dauer larvae share some features with the infective juveniles of pathogenic nematodes, which also arise in the 3rd larval stage. In some species, the 3rd stage infective juvenile neutralizes the host animal during infection by introducing septicemia-causing bacteria. How are the septicemic bacteria carried into the infected host? In the case of Neoaplectana carpocapsae Weiser, bacteria travel within the intestinal lumen of infective stage larvae, through a “Trojan horse” mechanism (Poinar and Leutenegger, 1968). Structurally, the intestine of the N. carpocapsae infective juvenile resembles that of C. elegans dauers. Both are sealed at the buccal opening and appear collapsed throughout the body length. Similarly to C. elegans dauers, the intestines of N. carpocapsae infective larvae contain numerous cytosomes with low-density microvilli at the brush border. The sealed intestine provides a crypt for hiding the symbiotic bacteria, Achromobacter nematophilus, suggesting the intestinal lumen serves a transport function to deliver the symbiotic bacteria into the host. A similar balance between host infective nematode and commensal bacteria is known for Heterorhabditis bacteriophora, where the symbiotic bacteria (Photorhabdus luminescens) can evade digestion within the J1’s intestinal lumen, sometimes residing as a biofilm in the lumen itself, then enter and replicate inside certain nematode tissues, including the rectal gland cells (Ciche et al., 2008). When abandoning one depleted host, the infective stage nematode carries these bacteria within itself, then spits them out into its next host, often an insect larva, where nematode and bacterium can reproduce again together in synchrony, to the exclusion of other bacterial species (Hallem et al., 2007). Edited for the web by Laura A. Herndon. Last revision: June 24, 2013.